While many convert their garages into extra living space, there are those of us who prefer to retain them for their intended purpose – a place to park the car. 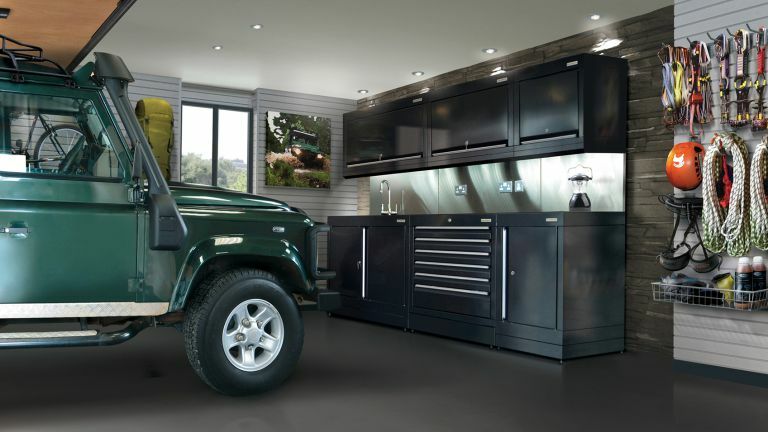 With off-road parking adding value (and convenience) to a property, it makes sense to keep your garage as a garage if you don't desperately need more rooms. But as many of us find, the garage not only becomes a home for your car, but also a whole host of other items. Bikes, ski gear, tools and even the Christmas decs can all find themselves jumbled in the back of a dusty garage. Which is why being organised is essential. So, here are some garage storage solutions to help you take your garage from a cluttered mess to the pinnacle of tidiness. Get everything up off the floor with floor-to-ceiling shelving. Open garage storage systems (using moveable brackets on fixed runners) can store everything you need, and maximise every last inch of space. Elfa's customisable shelving systems include different types of storage for hanging, stacking and hiding things away. They also offer a pegboard style wall panel to hold all manner of objects. Elfa storage systems can be designed to specification so prices will vary, but a similar array to the one seen below would cost in the region of £650. We've all seen the Chaplin-esque comedy sketches of people stepping on rakes, and leaving long handled tools like brooms lying around will invite this kind of continuous tripping hazard. So get tools up off the floor with a garden storage rack. You can also find smaller versions for screwdrivers, hammers and chisels to save you from rummaging in drawers of sharp tools. The Store 'n Slide 5-Section from the Container Store has the added advantage or sliding so it can be fitted in a narrow cupboard or cramped utility and slide out when access is needed. It costs £14.93. Garage storage on a ceiling can come in many forms, but all of the options save valuable floorspace, leaving room for a car and garage storage cabinets. A hoist is a great way to create garage storage overhead or for garage bike storage. This contraption by Delta (£34.86) uses a pulley system to efficiently lift and lower items. Seen here holding a bike, it could also be used for ladders or kayaks. Even if you use your garage as a dusty workshop, there is no reason why it can't look great. In fact, if you spend a lot of time in there – perhaps making furniture, or restoring a beloved sports car – then you should make the space as appealing and welcoming as possible. This storage and display solution from String (sold on Skandium) features open shelves for items you need to grab in a hurry, glass door cabinets for prized possessions and closed cupboards for hiding odds and ends. Seen here in walnut with black side panels, parts start at £42 and you can easily adapt it as your storage needs change. It is being used for a tack room here, but that just goes to show that even the muckiest of spaces deserve stylish storage. A handy pegboard is one of the most versatile storage solutions out there, and perfectly suited to the wide range of things we need to store in our garages. Use them for hooks to hang paintbrushes, rollers and cleaning paraphernalia, or add pegs to suspend garden tools or brooms. You can also easily add small shelves to them. The Little Pegboard from Kreisdesign comes with one shelf and six straight pegs. It is available in a range of colours including grey, blue, green and orange and costs £115. To make the most of a set of garden storage shelves, incorporate extra storage potential into the brackets. Hook items on to the brackets, or thread them through to be supported at either end. These shelf supports from A Place for Everything include tool hangers and can be used for tools, hose pipes, or cycling helmets. They measure H30cm x D25cm and cost £28 for a pair. While finding a spot for all the large, bulky tools and sports gear, don't overlook all the little bits and bobs that need somewhere to live. Never be scrabbling around for a bolt, screw or nail again, by keeping them save in a multi drawer. Time for a bit of DIY? This four-drawer storage chest from The Container Store has a handle, so you can carry it from room to room – goodbye pockets full of rawlplugs. The unit includes eight drawer dividers, should you wish to sub-divide each drawer, and costs £37.33. If you use your garage a lot, think about designing it in a similar way to your kitchen. You will need cupboards for storage, worktops and of course a sink for washing your hands, dirty paintbrushes and tools in. One option is to use a kitchen designer, but a specialist garage storage company will be able to supply drawers that are strong enough and appropriately sized for tools and hardware. Garage storage experts Dura design and fit luxury garage storage solutions including drawers, wall cabinets, shelves and their handy storage wall. They also provide hardwearing flooring, work surfaces and sinks for a complete, bespoke garage. Custom built to your requirements so prices will vary depending on specification. Keep everything from tools to out-of-season clothes dust-free but visible in a set of clear storage boxes or bins. These can either be stacked on shelves or in a corner out of the way. They will also protect your possessions from mould spores and potential damage from pests, such as moths or mice. Clear boxes are best so you can see what is stored in each, but if you use opaque ones, make sure you label them clearly. Choose boxes and bins in a range of sizes to accommodate different items. These weathertight totes from The Container Store have strong latches and an airtight seal. Prices start at £5.22 for a 17 litre box. The Samla range from Ikea comes in eight different sizes (from five to 130 litres) but they are all proportionate to allow easy stacking. Lids are sold separately, as are clips to keep the lids in place (although these aren't necessary unless you have a habit of cramming the boxes to the brim). You can also buy a tray insert that has two compartments, perfect for organising things within the boxes. Versatile, hardwearing and affordable – there are plenty of reasons why racking is a popular storage choice in garages. You can fill the entire rear wall of a single garage with racks for under £100, then add small drawer units, tool boxes and storage bins for a varied and inexpensive solution to all your storage needs. The InterMetro Gardening Storage Solution is a great option for garages, sheds and utility rooms. Hardwearing, ventilated shelves and sliding under-shelf drawers create enough space for the usual garden, car or workshop paraphernalia. These measure around H189 x W122 x D46cm, and the unit is priced at £151.56, but similar versions are available in larger sizes. Piling sports gear in a cupboard is not the best way to look after it. Fortunately, there are plenty of specially designed options for all of your sporting needs. Keen skateboarder? This board rack from The Container Store safely supports up to three boards and has handy holes for suspending bags or helmets from. It's a good storage solution for kids' scooters, too. Or build a sports storage wall to your exact requirements with this solution from Elfa, available at A Place For Everything. A similar sports storage system would cost from £536. Your car dominates the garage and cabinets take up what little space is left, so it might feel like there isn't much room for anything else. But – look up and think again. Overhead racks, suspended from the ceiling, offer another area to stow things away. Just make sure they don't interfere with your up-and-over door. They are better suited to lighter items to avoid the risks of lifting anything heavy over your head or up a ladder, or use them to support longer items that have no place on the ground (planks of wood, spare piping, skis even boat oars). Garageflex provide a number of garage storage solutions, including the overhead mesh shelves seen below.